University of Miami researchers have discovered a clue in the humble zebrafish’s digestive tract that, one day, could help people on the autism spectrum alleviate one of the most common yet least studied symptoms of their disorder: gastrointestinal distress. 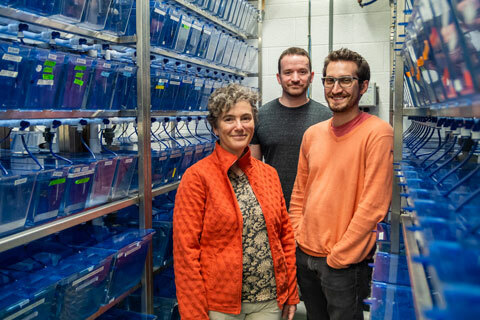 By replicating a mutation in zebrafish that causes a rare, autism-related genetic condition known as Phelan-McDermid Syndrome in humans, the researchers found a drastic reduction in the number of cells that produce serotonin in the mutant zebrafish’s gut. Perhaps better known as the body’s natural mood stabilizer, serotonin also initiates the contractions that move food through the digestive system. Published last week in the journal Molecular Autism, the study is the first to show that a mutation of a particular autism-associated gene, SHANK3, causes food to move through the digestive tract at an abnormally slow pace. While the finding applies to zebrafish, a common freshwater aquarium species that shares about 70 percent of its genes with humans, it could explain why many people with an autism spectrum disorder, and particularly those with Phelan-McDermid Syndrome (PMS), often suffer severe and disruptive bouts of constipation, diarrhea, reflux, and/or cyclical vomiting. About an inch long at maturity, the zebrafish is a valuable model for human disease because they have a similar genetic structure to humans. More importantly, it could open the door to treatments that alleviate such unpleasant gastrointestinal, or GI, symptoms. Flanked by tanks of zebrafish that enabled their study are, from left, researchers Julia Dallman, David M. James, and Robert A. Kozol. Dallman and two of her graduate students, David M. James and Robert A. Kozol, the first co-authors of the study, began earnestly modeling GI distress in zebrafish after they were invited to the 2016 biennial meeting of the international Phelan-McDermid Syndrome Foundation in Orlando. There they heard firsthand accounts from parents of children born with PMS which, caused by a deletion or mutation of the SHANK3 gene at the end of chromosome 22, is characterized by moderate to severe intellectual disabilities and developmental delays, absent or delayed speech, decreased muscle tone, and epileptic seizures. Yet, despite all those very daunting challenges, parents often expressed deep frustration over their child’s GI issues, which affected their quality of life on a daily basis, often making ordinary routines and milestones, like eating and toilet-training, exceedingly difficult. Now, the common zebrafish and James’ interest in characterizing GI issues in autism seem destined to help shed light on the confounding problem. About an inch long at maturity, the zebrafish is a valuable model for human disease because, aside from having a similar genetic structure to humans, it develops rapidly and, until its second week of life, is almost completely transparent. That’s when it begins developing the telltale dark stripes for which it is named. That early transparency, coupled with an apparent zeal for what juveniles consider yummy food, enabled James and Kozol to record what happens when zebrafish lacking the shank3 gene digested chicken egg yolks, which were infused with tiny, florescent-green tracking beads. The films clearly showed that the mutant fish not only had slower and less frequent gut contractions than normal zebrafish, but that the ingested food particles got stuck in the junction between the stomach and the intestine for prolonged periods of time. The reason came as a surprise. Initially, the researchers hypothesized the shank3 mutation somehow damaged the fish’s enteric nervous system—the “brain” that controls the gut—but that was perfectly normal. Instead, the researchers found the shank3 mutants had drastically fewer serotonin-producing cells than their wild-type counterparts. The answer may lie in the distant future, but this first crucial step in unraveling a biological reason for autism-related GI distress is heartening to members of the PMS foundation, which began as a family support group in 1998, when 20 of the 23 families then known to be affected by a deletion or mutation of chromosome 22 first met. Today, nearly 200 affected families from around the world attend the foundation’s meetings, the last of which was held in Texas last summer. That’s when James presented UM’s research on intestinal dysmotility in zebrafish, which not only won the conference’s research award but gave parents like Gail Fenton hope for a better future for their children. 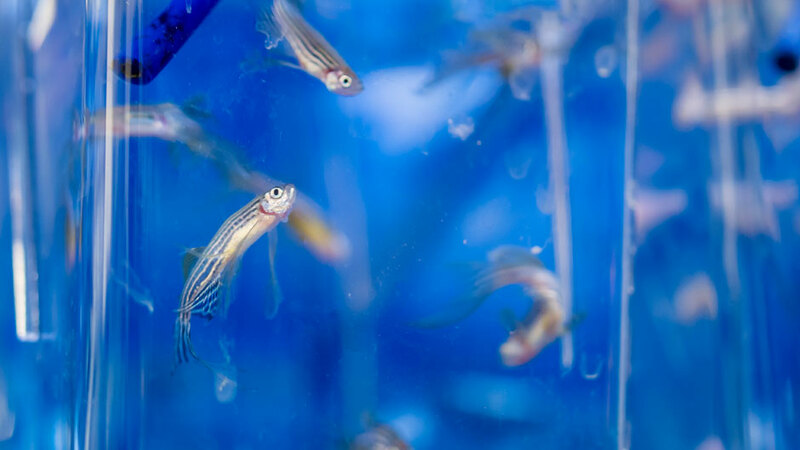 The study, Intestinal dysmotility in a zebrafish (Danio rerio) shank3a;shank3b mutant model of autism, was supported by grants from the National Institutes of Health’s National Institute of Mental Health and Eunice Kennedy Shriver National Institute for Child Health and Human Development. In addition to Dallman, James, and Kozol, the coauthors include Yuji Kajiwara, of the Seaver Autism Center for Research and Treatmentat the Icahn School of Medicine at Mount Sinai, New York; Adam L. Wahl and Emily C. Storrs, UM undergraduates; Joseph D. Buxbaum, also of the Seaver Autism Center; Mason Klein, associate professor in UM’s Department of Physics; and Baharak Moshiree, of the University of North Carolina’s Division of Gastroenterology.